This is the final segment in this 4 Part series. We have previously discussed the basic components of an IP network and the functions of those components in the first segment. We then took a closer look at Routers and Switches in segments 2 and 3. In this issue we will discuss Wireless Networking, with a focus on Wireless Access Points (AP). 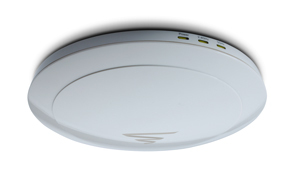 802.11a: The first version of wireless networking designed for common use. Because support was limited to 5GHz bands, it was not widely adopted until more recently. 802.11a offers a maximum speed of 54Mbps. 802.11b: Designed for 2.4GHz bands and mass markets, 802.11b quickly became much more popular than its 5GHz predecessor. 802.11b has a maximum speed of 11Mbps. 802.11g: A 2.4GHz upgrade to 802.11b that improves maximum speeds to 54Mbps while also adding better wireless security. 802.11n: The current standard that offers the widest range of support. Although 802.11n is currently most commonly used for 2.4GHz networking, it can also operate in the less crowded 5GHz ranges. This being the case, “Dual-band” wireless devices are becoming more popular. 802.11n supports Multiple Input Multiple Output (MIMO) technology, which essentially means that there are multiple simultaneous data streams in operation, increasing the data throughput rates. With 802.11n, each data stream offers a maximum of 150Mbps. So, a 3 stream 2.4GHz only AP, has a maximum speed of 450Mbps, while a dual-band AP with 3 streams on each band offers a maximum speed of 900Mbps. 802.11ac: The newest revision to wireless networking is 802.11ac, with the IEEE standard still yet to be ratified. 802.11ac is designed specifically for 5GHz and offers even higher maximum speeds that can exceed 1Gbps. 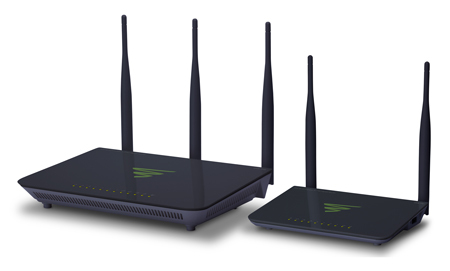 A dual-band 802.11ac router can currently reach maximum speeds of 1750Mbps. When selecting a wireless AP or router, keep in mind that these performance numbers are theoretical and based on best case scenarios in controlled environments. The actual performance depends on a number of things, including the client device, speed of the source network, and interference with other networks. As was mentioned briefly in the first segment of this series, there are two primary options for Wireless networking: 1) An all-in-one device commonly referred to as a Wireless Router as shown in Image 2; and 2) a Wireless AP, which can take on many forms as demonstrated by Image 3. Wireless Routers offer an excellent amount of coverage and processing power for smaller home networks with 20-30 client devices. For a more robust network in larger homes and commercial environments, using an AP together with a high quality wired router will be much more effective and deliver a better overall experience, especially for data intensive applications. 2.4 GHz Only or Dual Band? Client Device Support: While 2.4GHz is still the de facto standard for most devices, 5GHz is becoming more common. Interference and Signal Coverage: 2.4GHz is superior for propagating signal through dense materials. However, because of its popularity, it is also prone to more interference. 5GHz has less interference and potentially higher data rates (i.e. 802.11ac), but there are some limitations in terms of range. 5GHz can be an especially attractive choice for heavy populated areas, while 2.4GHz is probably sufficient for more rural areas. When selecting a Dual Band AP, be sure that it supports “simultaneous” or “concurrent” operation. This means that both 2.4GHz and 5GHz function at the same time, such as the XAP-1500 shown in Image 4. Simultaneous dual band equipment is a bit more expensive, but will help ensure better overall wireless performance. Whether to choose Single Stream (802.11a, b or g), or Multi-Stream (802.11n, ac) really is a matter of balancing current network performance expectations with long-term relevancy of the network. Keep in mind that for most networks today, the connection from the ISP is the single greatest limiter of network performance. Even 802.11g equipment can still outpace the performance of most cable or DSL connections—although that is starting to change as providers continue to improve their offerings, which is a good reason to consider using later wireless technologies for future-proofing the network. Also note that for internal Local Area Network (LAN) applications, having higher data rates available through Multi-Stream APs can enhance the network experience for certain demanding LAN-based applications. Finally, for many users there is also a perception that latest and greatest is always the best, yet another reason to consider 802.11n and/or 802.11ac products. No wireless article would be complete without touching on the subject of client roaming and whether or not a wireless controller is necessary. While controllers are fantastic for ensuring an overall better wireless experience in large installations, they can also increase the network costs significantly. Also it is important to note that not all “controllers” are created equal and that many of them provide little more than node configuration while doing little to nothing to actually manage the roaming process. To help eliminate and/or minimize roaming issues without breaking the budget, the Luxul approach has always been to use high powered APs that deliver broader coverage. Our installers have consistently found that this approach can deliver excellent and reliable coverage—essentially doing the work of 3-4 APs with only one. That’s not to say there isn’t a place for wireless controllers in larger installations where the budget permits and the right technology is used to actually solve the roaming issue. We will further discuss controllers and roaming in a future column. While this is a far from comprehensive list, hopefully it provides a good overview of how to go about selecting which wireless technologies are best for your various client applications. As with all networking gear, there is no one-size fits all and it is important for an installer to understand the implications of using each option in order to best deliver an efficient and affordable wireless network.